The Agostini Nautica group, established in 1973, consists of three companies: Agostini Nautica, Resin Craft and RDE. 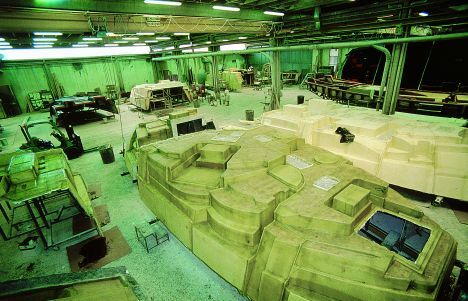 The 12.000 square metre production area - 4 premises with 170 employees - is one of the world's most important in the hull moulding sector and is currently the biggest Italian supplier of fibreglass items for pleasure craft. Turnover for 2002 was ? 10.000.000. Considerable quantities are involved: more than 250 hulls and decks, between 12 and 35 metres, produced annually on premises which we have attentively visited, gaining hands-on experience of a highly efficient working organisation. Agostini Nautica has fine- tuned technologies and building procedures that are increasingly innovative and ahead of their time. Over more than thirty years of activity Agostini Nautica has made its name as supplier to the most important Italian shipyards, above all because its success is based on "dialogue" with customer companies, in all cases offering its skills right from the first design phases and cooperating directly with the designer and the technical departments of the individual yards. The distinctive features of Agostini Nautica products are quality and reliability, but always with a careful and competent eye open to the study of detail, employing both the most advanced technologies and the most traditional craft skills. 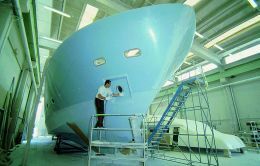 Would it be true to say that on the yachting sector production scene there's fibreglass and fibreglass? In the yachting sector materials are fairly traditional. In the motor vehicle and aeronautical sectors they are very advanced while we're pretty much behind. Costs first of all, and then because there's not much research on fibreglass and hulls. On interiors, motorisation and lines, yes, but not on the building materials. Now and then attempts at improvement are made with proposals of new technologies and solutions, but as soon as the yard hears of a 10 to 15% increase in costs, it is unlikely to accept. Let's put forward a hypothesis based on two variables, economy and product quality. To what extent is it worthwhile for a yard to outsource fibreglass construction to a specialised company like yours? It's worthwhile in all cases because companies like ours are specialised, they follow new avenues and continually experiment with innovative technologies. For some time we, for example, have been using infusion, a process for working fibreglass which is similar to Scrimp (stratification under vacuum) but different with regard to the materials employed and to certain procedures (such as setting out the fabrics to make the GRP run better etc.). Do you think vacuum infusion is the future of fibreglass? For the moment we don't have enough data to say so with certainty. We're experimenting and already working with this technology. Some of our customers believe in it, others don't. Certainly final product quality is better, and certainly it is more expensive which, at the moment, could be a problem. Another problem could be the fact that infusion is a technique, not a special technology of the utilisation of materials which, moreover, do not have characteristics specific to this technique apart from "arrangements" suitable for infusion. The costs question should also be related to the experience which, with time, we'll manage to achieve. In the current experimental phase we're talking about a 15% increase. Should the vacuum infusion technique get into full swing, cost increases of 6 -7% are envisaged. Given that a boat made with the infusion technique will be of superior fibreglass, what are the advantages from the production point of view? There are many: firstly, the possibility of governing and programming the production process. Which means knowing in advance how much resin you need, being able to count on greater uniformity of resin within the product, being able to largely sidestep the human factor which may often make, and today does make, all the difference. Then there are many improvements at environmental impact level, a better working environment for our technicians and labourers and a more targeted use of a workforce that will be less numerous but better trained and more specialised. Are there openings to foreign markets? We've got plenty of contacts and we're trying to further intensify and consolidate them. We built a thirty metre yacht for the English market, a 25 metre for a German yard and we've got a contract in France for a 20 metre catamaran. All in all, we're looking to the future.